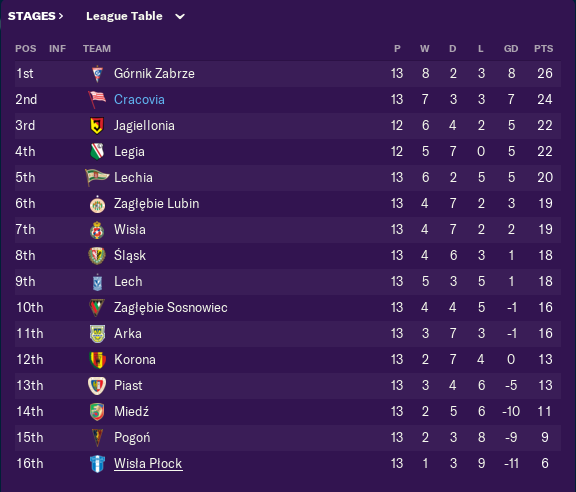 So Poland is my destination for a little break from Woking as i try and find my Football Manager mojo back. I haven't strayed too far though with the clubs colours being exactly the same as Woking with Red and White stripes. Why Poland and Krakow? Well i am getting married this year and my stag do is coming up and although the boys tried to keep it a secret, i have found it we are off to Krakow in what no doubt will be a trip that will take some part of my soul. So, with much naivety i thought providing some fictional success to one of its football club, might mean the City takes it easy on me. 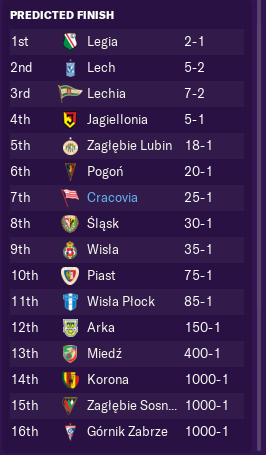 So with Krakow chosen, i had three playable clubs to choose from (Cracovia, Wisla Krakow and Garbarnia). 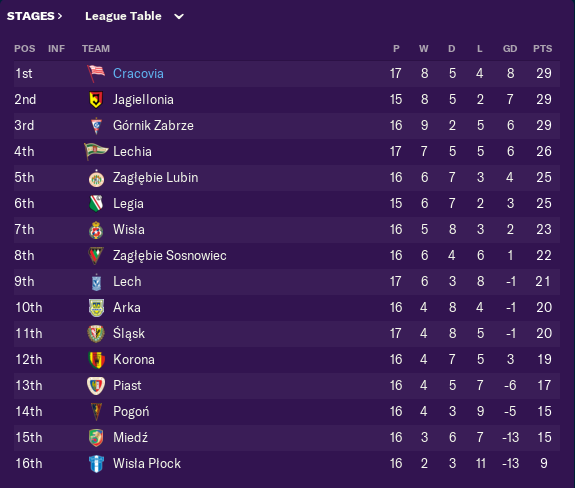 Garbarnia are in the 2nd flight and i thought it would be a little too small and maybe a little too similar to Woking whilst Wisla are a traditional big side and Cracovia ended up being something in the middle. It has History and i have the chance to build a dynasty here. 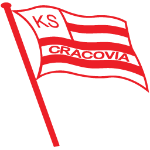 Cracovia are a football club based in Krakow, Poland and are in fact the oldest football club in Poland having been formed in 1906. With a club that old you would expect some history and you wouldn't be disappointed as the club have 5 League titles to their name. However, the slight catch is the last of them league titles came in 1948! Other than them 5 league titles, it is just a small smattering of lower league Championships which gives you an indication of what happened to the side. Just 6 years after winning their last league title, the club found itself in the 2nd flight having been relegated. Throughout the 60's the club became a true yo-yo side winning promotion 3 times but getting relegated the very next season. The last relegation from the top flight in 1970, saw the side slip to its worst ever position finding itself demoted to the 2nd tier, than the 3rd and than the 4th tier. It's worst ever position. The club quickly got itself back into the 3rd tier but found itself stuck at this level for a number of seasons. In 1978 the club finally returned to the 2nd flight and it was just 4 years later in 1982 that the club finally won promotion to the top flight after 13 long years away. It was a short lived joy though as just 2 years later the club suffered relegation to the 2nd tier and than quickly to the 3rd tier. The rest of the 80's was a grim time as the club suffered financially and it didn't get much better in the 90's as the club yo-yo'ed between the 2nd and 3rd tiers. In Mid 2002, the club finally caught a break attracting a rich sponsor (Comarch) finally giving the club some money for development finallly getting itself back into the top flight for the 2004-05 season where the club has remained other than a small spell in the 2nd flight for 1 season in 2012-13. So that brings us to the modern day and my takeover. 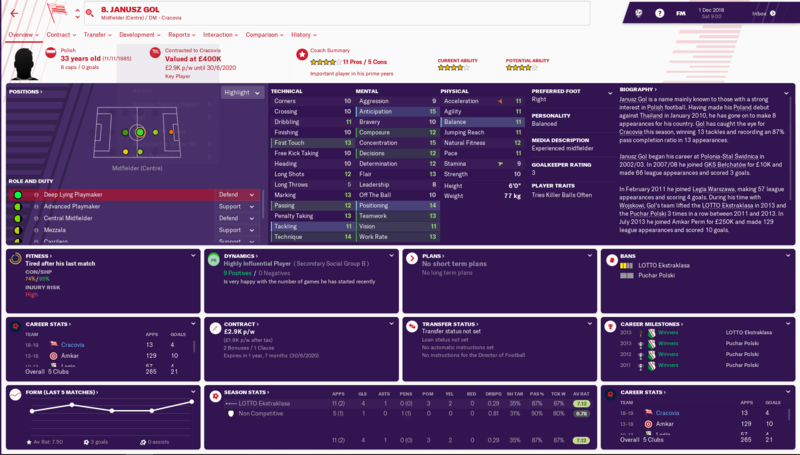 So i have made myself a Polish national and i have decided to go heavy on the mental attributes as well as youth development as i look to build from my own set up. Technical skills are also something i want to do as i want to try and play decent football. Both of these play into what the club want to do as they look for a top half finish (Media Predicting us 7th) whilst playing possession football and developing players from our own academy. Both of which i can get on board with and will play a factor into how i set up the side. In order to finish in that position they have given me an additional £4k per week in the wage budget as well as £460k to spend on some new faces. So what do you think? Good move or no? First impressions, it is a big squad, possibly too big but it gives me loads of options as a lot of the player's can play in many different positions. The second thing that hit me was i had never heard of any of these players and the third thing was we had no superstar at our disposal. Our success would be based on the whole and not the individual which means the tactic was going to be even more crucial to our success. From the squad, i could see 3 first teamer's that would help create the spine of the team. Croatian Niko Datkovic is a big 6"3 centre half with lots of strength but a bit lacking in pace. Still he is solid in all of the crucial stats and as long as we protect the lack of pace he should be a rock at the back. Damian Dabrowski is currently injured but looks to have decent stats all around and some potential left to grow into. I suspect his current injury has knocked his stats down a bit so once he returns we will see an even better player. On-loan Spaniard Airam Cabrera is easily our best striker with good overall coverage in all areas which should mean he is pretty versatile when it comes to roles. Interestingly with Polish football there doesn't seem to be a reserve side or an U23 side and insteaad it goes straight into an U18 side after the first team. It means the youth either need to be ready at 18 or have somewhere to go in order to get ready. With no affiliate set up, i asked the board to get me one and local side Garbarnia Krakow will become my new affiliate and will likely be the main destination for promising players to learn their trade. I have also revamped the whole of the 1st team's backroom staff with just the medical team remaining for now whilst also increasing the number of coaches meaning we have one of the best coaching set ups in Poland and hopefully will allow me to develop the players into my chosen tactic. The Board want possession football and i plan on attempting to give them that. The squad isn't overly excellent in passing so i think it will need to be a simpler form of possession football, hence why i have gone with the below as my main stating tactic. The aim is to take our time with the ball, keep the tempo down as we dont have the greatest fitness or pace and to dominate possession of the football. I would normally say Ball playing centre halves are the right move but none of my centre back's are that comfortable at passing (Most have around 9-10 for this stat) so i am just going to keep it a little simple with normal CD roles. I am however, trying to improve all of their passing through training in the hope i could switch at least one role in a BPD. The full backs are going to play as wing backs to give us extra width and men in the attacks with the wingers coming in as inside forwards to allow the extra space for the full backs. Right back Rapa is pretty comfortable with this whilst our best left back will need a little work. It is relatively simple roles in the midfield with Cabrera asked to be a deep lying forward to allow him to also get involved in the build up play. By coming a little deeper it should open up room around him for the Inside forwards to get behind the defence. A second tactic is also being looked at with the AMC switching to a DMC role and will be more counter attacking in nature so will likely be used in the games against the bigger sides and potentially Europe should we get there at some point. A relatively straight forward pre-season as we went undefeated whilst keeping clean sheets in all but one of the games. Defensively we look solid with the only goal conceded being from 20+ yards whilst we look very comfortable with the ball. The final 3 games saw us have a minimum of 55% possession and dominate the game in terms of shots on goal. I guess the only concern right now is the number of goals compared to our dominance as the analysis seems to show a possible predilection to trying to walk the ball in to the back of the net. All of this ties in with the analysis from the matches. I think right now, i am going to leave it for a little bit longer but i am sensing the removal of the work the ball in to the box instruction could mean we are a little bit more decisive in the final 3rd. This is a welcome addition to the story section. An interesting team choice in a fairly obscure league, which provides plenty of intrigue for me. Looking forward to seeing how you fair with Cracovia. My Polish adventure is now officially in full swing as the season starts here in Poland and we are now 6 games into the season. For those that don't know the league structure, there are 16 teams in the league and we play each other twice. The league is than split into two and you play the other 7 teams in your half. There is no point halving like in other leagues but it just carries on. So pretty similar to the Structure in Scotland. So how did we get on? A slightly mixed bag on face level but there has been some very pleasing aspects to the style of play that is on show. Airam Cabrera has been the clear highlight of the team banging in 6 goals from the first 4 league games and being a major reason why we won 3 of our first 4 league games. In the one game we lost to Lech Poznan who were playing at home infront of no fans we dominated with 67% of possession but we just couldn't make our dominance count and we were hit on the counter far too easily. 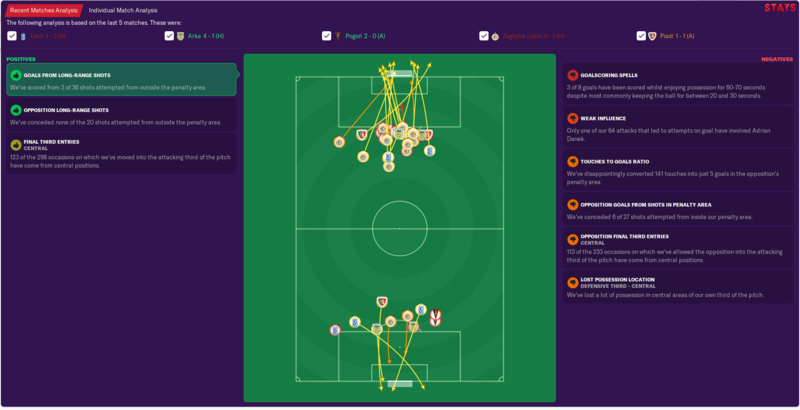 Ironically in the next game against Arka we did the exact opposite, scoring from all 4 of our shots on target and hitting them on the counter time after time. A tight table at the top as everyone is dropping points right now. If we can hit a nice bit of form in the next few months we might be able to keep ourselves in the pack. So the transfer window closed and i almost went the whole window without making a single transfer as i decided to take my time and really think about what we need. We have a big squad and i dont know any of the players so i feel like i need to bide my time and see what works and what doesn't work. The main priority was to scout players for future windows and i was mainly looking at ball playing centre halves and left wing backs as i know the current players dont quite fit the mould but should be ok for now. In the end i bought a goalkeeper. 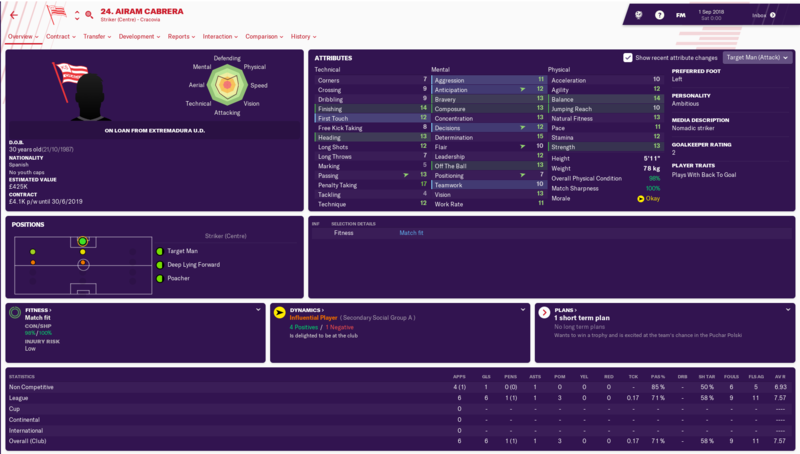 So a little detour but i was also looking for goalkeepers for next summer and when Osman Hadzikic was available on a free transfer i snapped up the young Austrian. I have worked with him in previous saves so i know he has decent potential and with my first choice picking up an injury (Another reason to make the move) i moved a summer early. I will probably try and shift one of the keepers on in the winter to make permanent room for him. Other than that the only outgoings were a lot of the U18 side on loan plus a 19 year old striker that was never going to make it in a permanent £8k deal. So far i am pretty happy. We knew we wouldn't walk the league as we just don't quite have the quality here. What has become evident is that we need Cabrera a lot and if he doesn't play well than we do struggle to score as is evident from the analysis of the matches. We need to turn our touches into goals and we need to be more compact in the centre of the defence. I am going to remove, work the ball from the box for a little bit to see if that helps whilst keeping the passing short so we should still keep possession. I have always wanted to do a save in Poland, hope you enjoy it! A month of two halves on the pitch as we struggled in the first two games of the month before making a switch and seeing some better performances in the final 3. To be fair, the first game of September was against Legia Warsaw who have won 4 of the last 5 league titles so were always going to be a tough match. It was a debut for Osman Hadzikic but also a debut of our 2nd formation (AMC switched to a DMC). We lost 1-0 thanks to a penalty but in truth it was a bland match and one we actually struggled for possession in it. I have to admit i wasn't entirely convinced by the formation so i think some tinkering will be needed. Back to a our main formation for the game against Jagiellonia we had a 1st half where we scored first but went into half time behind 2-1. 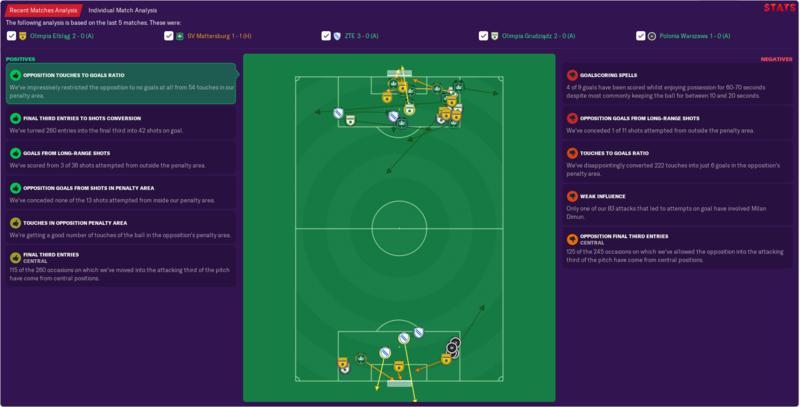 Plenty of possession but no end product meant i removed work the ball into the box as an instruction, hoping we would get a bit more direct in the final 3rd and we finally got our equaliser when a lofted ball over the top was latched onto my Cabrera. The game ended 2-2. For the rest of the month, i kept "Work ball into the box" off and we picked up 3 victories on the spin. None overly impressive but we certainly seemed to be getting more chances even if we were not always taking them. The Wisla Plock game started and ended with free kick goals whilst the Cup game saw me rest my 1st team squad and give Damian Dabrowski a 1st start since his ACL injury. We ended the month with another victory to keep us moving up the table. So far so good and its still incredibly tight in this league. A poor patch and you could be dropping down the table but a good little run and you could be right in the hunt for the title. Osman Hadzikic has been excellent since his arrival getting 3 ratings of over 7 which in my world is unheard of for a Keeper. Wisla Krakow and Cracovia is not like most derbies. It is one of the most violent and passionate derbies in Europe and these teams have been at it for over 100 years. The name of the Derby was coined by a Cracovia defender Ludwik Gintel who before one game told his teammates "Come on guys, let's win this holy war". The phrase was than put into a song and the rest is history. The two clubs grounds are just 1km apart, are serviced by the same bus stops yet the away fans still take a coach to the other stadium due to the violence that is often seen. It probably doesn't help that the two firms Wisla Sharks and the Anti-Wisla are the only two firms in Poland not to sign the "Poznan Agreement" which is an agreement not to bring weapons to any fights. So why the anger? Well Wisla was owned by the Communist Police force for over 40 years whilst Cracovia have Jewish roots and with Poland's history, you can kind of see why that might be a big deal. That heated rivalry has seen some of the ugliest and craziest scenes in Poland. In 1942, the derby didn't take place because the Nazis were informed of the time and place of the match. When the German forces arrived, the game was abandoned. The following year, over 10,000 people came to see the Holy War back in full force. After the referee gave Cracovia a penalty kick four minutes before stoppage time, Wisla players attacked him. The players, not the fans. Can you believe that? As a result, the whole audience was engaged in a huge brawl. In the early 1970's, Cracovia began to be relegated into the lower leagues and so the Krakow derby had to be put on hold. Supporters couldn't stand this thought though, so they convinced authorities to have an annual anniversary derby. The matches had nothing to do with points. It was all about bragging rights. These matches took place until 1990, when possibly the most unbelievable set of events took place in Polish football history. Police officers went at it with supporters. That wasn't shocking, but the actions of the police were considered too brutal. Therefore, they were counterattacked by supporters of both teams. Wisla and Cracovia fighting the cops side by side. Eventually, the USSR consulate was trashed that day because some of the policemen ran there for safety. The Krakow derby for shits and giggles was banned for good this time, and no Holy Wars have taken place since. In 2006, the 100 year anniversary match was played between Wisla Krakow and MKS Cracovia. Eight fans died in the events leading up to the derby. Water cannons, riot vans, choppers, dogs, and nearly 1,000 cops were on hand during the game. Wisla scored a minute into the game and one of the supporters was about to burn a Cracovia scarf. The police took it away, so a battle ensued with the cops. Cracovia fans were in the away section and there was a huge fence to separate the two firms. At halftime, hundreds of Cracovia scarves were burnt along the fences by Wisla fans. This is while winning, imagine what happens if they lose. Cracovia supporters tried to break through the fence but the police intervened. Chairs proceeded to be ripped out and thrown at the cops. The match ended 3-0 for Wisla Krakow. The Holy war is some way to start a month and we were straight into it as we entertained our arch rivals Wisla Krakow. Things started off with a bang as Italian Antonini Culina rifled in from the edge of the box after just 8 minutes. Strike 1 to us but things only got better as a goal mouth scramble was turned in by Airam Cabrera to double our lead and put us in the driving seat. 2-0 up in our first derby and life was good or so i thought as we were hit on the counter to see our lead halved before a late goal sent the Wisla fans into pandemonium as the game finished 2-2. Gutting based on where we were but at least i didn't lose. Quite simply it goes, League = good, Cup = very bad. 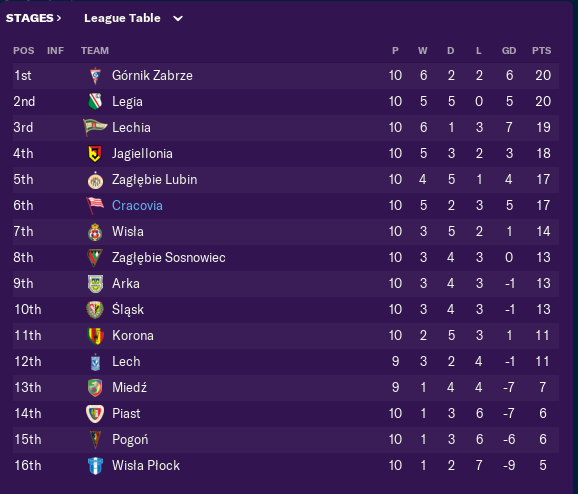 Two tight 1-0 wins against Gornik Zabrze and Korona thanks to Cabrera's coolness under pressure have really pushed us up the league but there is still a little problem which is we can sometimes dominate matches but just not dominate the result and eventually we could make a mistake and for all we know it we get punished. Now onto the bad as in the 2nd round of the cup we lost to lower league opposition with a rested side. It was 0-0 at full time but we were down to 10 men and the extra man advantage saw them come out 3-0 winners and we were on the end of a giant killing. Always fancied Cracowia even though my good friend from Krakow supports Wisla. Looking good this one. 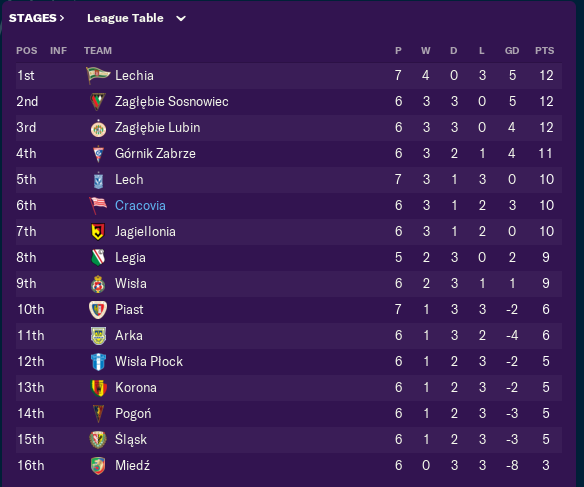 A very bright start to life in Poland with Cracovia. To lead 2-0 and then draw with your bitter rivals must be slightly disappointing though. You'll get them next time! A great start to life in Krakow! What i have noticed with Cracovia, is that after a loss we can sometimes take our time getting back into form. A hangover of some sort as we came off the cup loss to take on Miedz in the league. One of the weaker sides in the league and what should have been a fairly comfortable victory. Stat wise it looked the case as we had 75% posession had 19 shots to their 7 but we still came out 2-1 losers. That than led to two draws against Lechia and Slask before we finally got a victory in November against Lech Poznan. Who ironically were the toughest side to play as we raced into a 3-0 lead before eventually winning the game 4-2. What was even more interesting is that 3 of our 4 goals came from outside the box as we scored screamer after screamer with Janusz Gol banging in two of them. In fact Gol's performances in November won him player of the month for the league. So 5 points from 4 games would see us slip down the table right? It is certainly an odd little season in Poland where no team/s are breaking way and in theory the race is wide open. 9 Points between the top 11 is crazy and shows another dodgy little run and we could fall out of the top half. The others game in hands will see us drop down a little but at this stage i am still just dreaming of a top half finish. 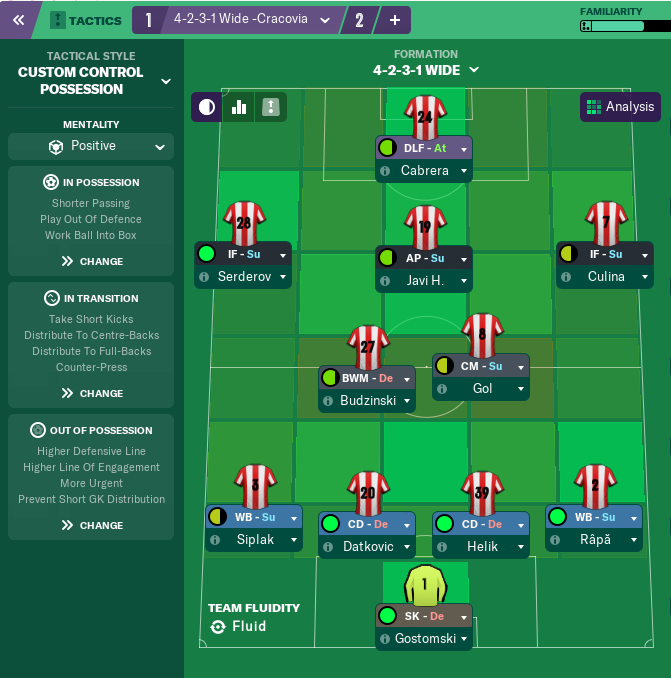 With the winter window coming up, i am now starting to evaluate everything we are doing to see what can help us kick on in the back half of the season. What has become evident is that we are scoring from outside the area a lot evidenced by Culina's placing in the goal of the month. Now whether this is because i have taken the work ball into the box instruction off i dont know but we seem to have gone from one extreme to the next. Before we were taking too much time in the box and not getting enough shots and now we are just trying to crack them in from everywhere. I wanted to see the team get behind the defence but we are just not doing it and Airam Cabrera is struggling for goals now up top. Which also highlights a problem. We just don't have a Plan B if certain players are not playing well. Cabrera is our only decent striker and we have just 1 really good option in the AMC slot whilst our back up wingers are average and dont seem to be able to change the game if they come on. So i think changes will happen and i am now scouting around for options. 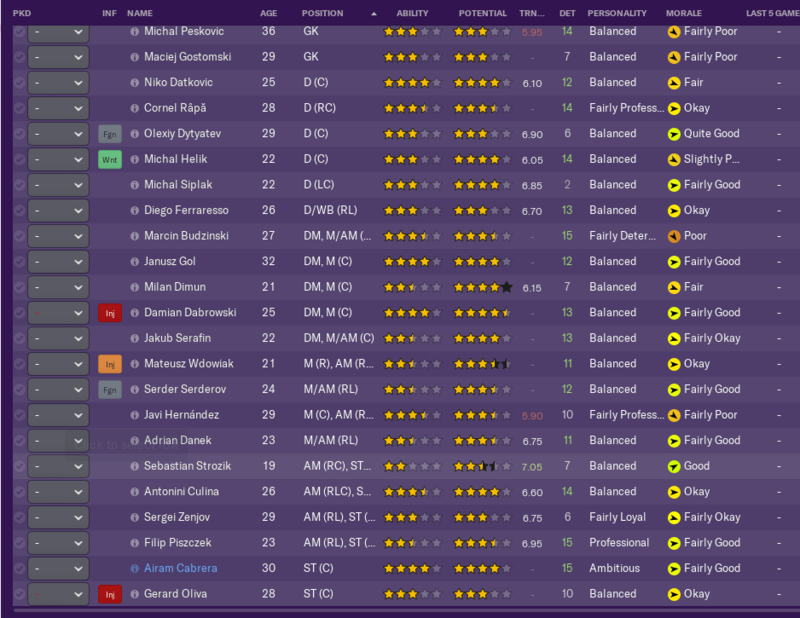 My preference is going to be loan's as i have a couple of players who were loaned out in game before i took over who would go straight into the first team and i don't want to give myself too much of a bloated squad in the summer. We have around £4k per week to play with in wages and around £230k in transfer fees plus any money we make from sales. More work to be done in December i think. 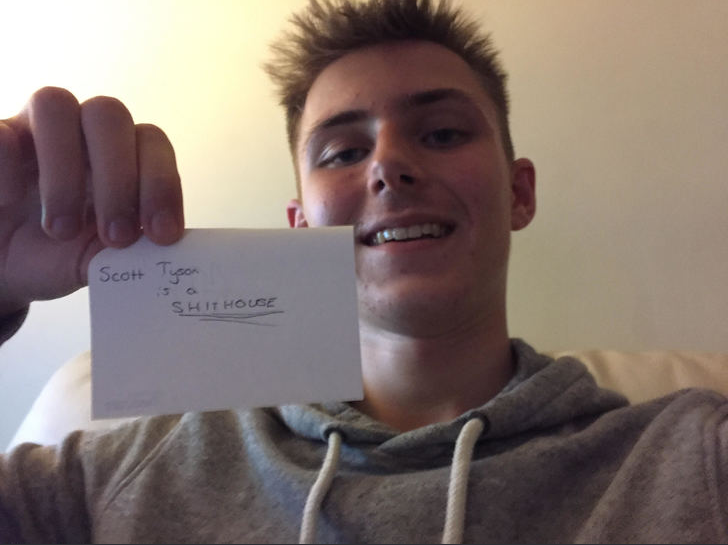 Thanks for the support guys. This save is certainly helping me re-love the game after a slog with Woking in that last season. 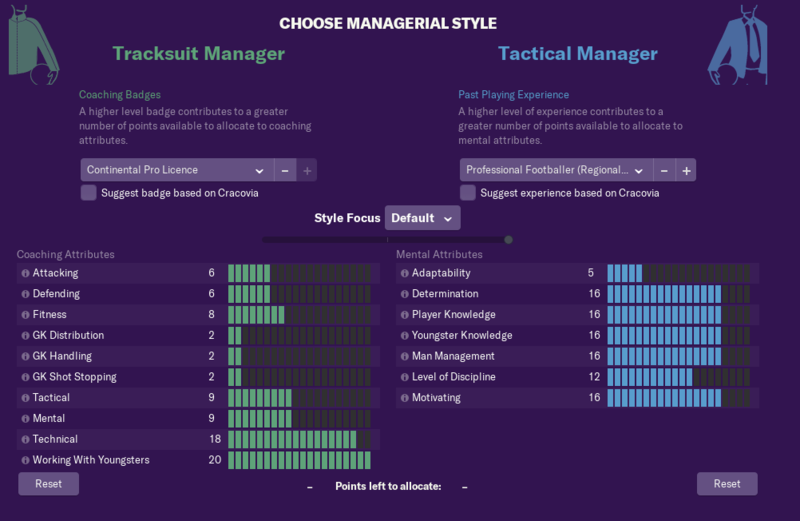 I am definitely getting more involved in tactics and the analysis screens and it is giving me a few ideas to take back to Woking. It's interesting to see such an open league. Your form is certainly good, but leaves a little to be desired - yet this is enough to allow you to be leading the way so far. I'm keen to see if this changes as the season goes on and one team manages to stabilise themselves and get a good consistent run of form together. You are reading "Having a Crac Ovia here in Poland".